EVGA GTX 1070 Review: Is it a Good Option for Mining? As the prices of cryptocurrencies settling in after the 2017 bubble, the miners now want to build a rig with hardware that offers them affordability and a sweet spot for profitability. Are you also among those who want to start with something affordable but productive at the same time? 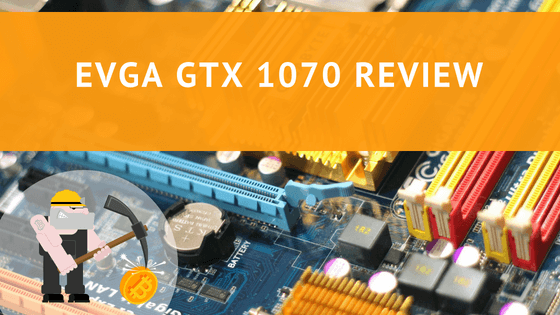 If yes, the EVGA GTX 1070 offers you a good option to invest in, and in this EVGA GTX 1070 Review, we will explain why. The latest version of their gaming GPUs by EVGA that can be used for mining as well is GTX 1070 Ti GPU. It is similar to the GTX 1080 in terms of configuration, architecture, and mining performance, which is a commonly used GPU in mining rigs. Both have similar amount of transistors, belong to the same GP 104 GPC family, have similar core clock, core config, and L2 cache. So, the EVGA GTX 1070 Ti SC Gaming almost offers you the same mining performance as GTX 1080. As it is a gaming GPU, you can also use it for gaming as well as for mining. You can easily connect it with your motherboard using PCIE x16 port. Use ASRock H81 PRO BTC or GIGABYTE GA-H110-D3A motherboard. If you are looking for the best 6 GPU motherboard for your mining rig, make sure to read our detailed review. For ASRock H81 PRO BTC motherboard, you can use Intel Celeron G1840 CPU. For RAM, a good option is Kingston HyperX FURY 4GB 1333MHz DDR3, while you can also use SSD ADATA SU700 120GB. The GPU is also good enough to work with Ethash, Equihash, and CryptoNight algorithms. This means, it is a good option for all popular cryptocurrencies like Ethereum, ZCash, Monero and more. Even though you can use it with all above-mentioned algorithms, but in our experience, it works best with Equihash algorithm. What does this mean? It is a very good option for ZCash, Zclassic, Hush, Zencahs, Komodo, and other Equihash based cryptocurrencies. There are plenty of reasons to use EVGA GTX 1070 Ti SC for your mining rig. It is affordable, comes with rugged fans, and decent clocks. It doesn’t produce a lot of noise, and its dual fans keep it from heating up even with 24/7 use. Previous articleWhat is the Best Energy Meter for Crypto Mining?